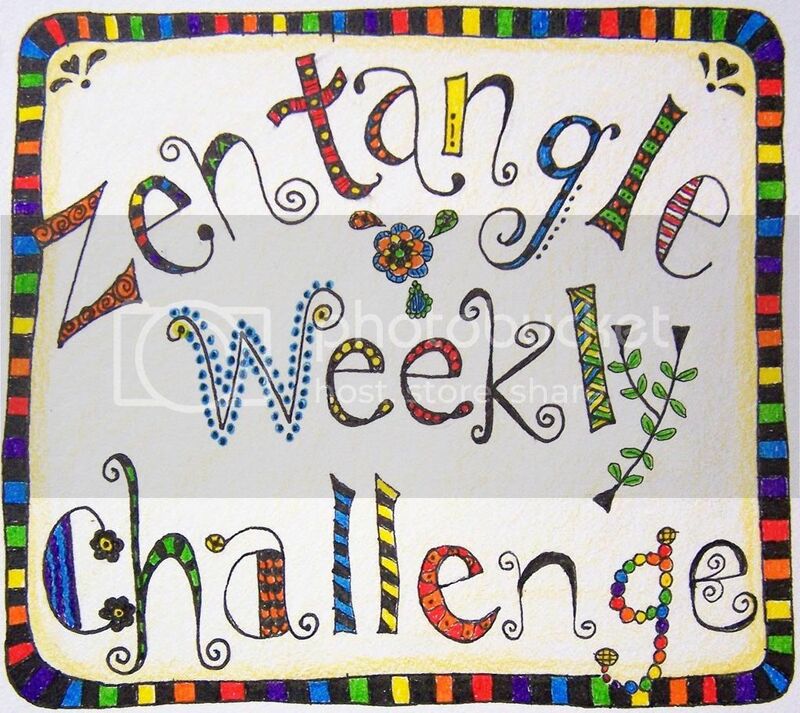 Hello and welcome to the Zentangle® weekly challenge! - when you have completed your artwork, return to this post to Link Up a photo of your artwork. Note: if you don't feel comfortable sharing your drawings then please let us know you are participating by leaving a comment. Please only share photos, posts or Pins that you have done yourself AND match the week's challenge. Every week I will have a new challenge so you will have plenty of opportunities to share your art! Please remember this is a child friendly site. Use the comment section to tell us about your drawing or to ask questions. Offering support to your fellow artists is cool too! 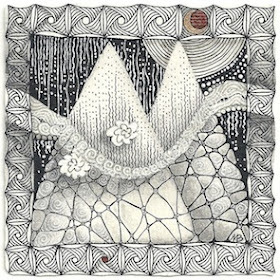 Note: I am not a 'strictly by the book Tangler', I find that drawing Zentangles awakens my creativity which often leads to other drawing techniques and styles. 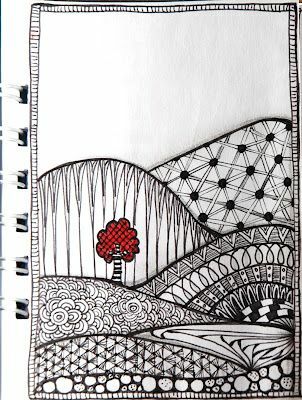 For more info about the art of Zentangle® click here. 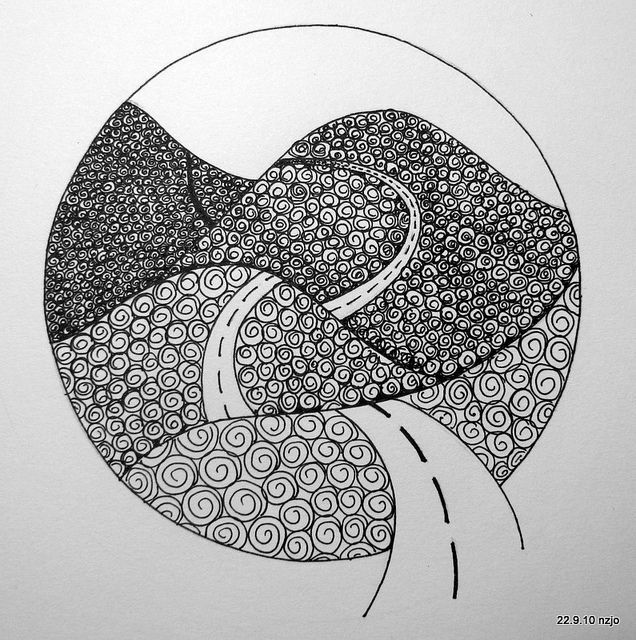 For my weekly challenges I will be combining several drawing techniques in these challenges so that each challenge will be fresh, stimulating and rewarding. Week #5 and we're going to expand our horizons today...literally! Any shape (love the circle below! ), any pattern, black and white or colour it's entirely up to you. 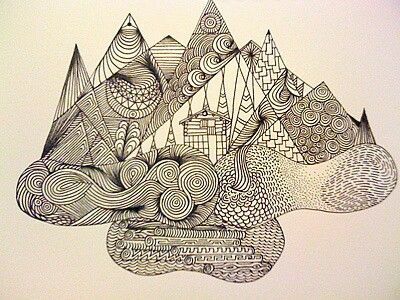 When your artwork is complete, take a photo and come back to Link Up your mountain zentangle to the Gallery below. And remember those of you not ready or able to link up your artwork, let us know you're here in the comments. This week was extra fun because my son joined in. We used String #64 because it looks like mountains. Thanks Joey. That is so awesome Kylie! I was hoping some children would join in. I love it when children try things that their parents are doing, it's the best way to learn! And how clever are you to know that there was a string called mountains?! I have learned so much through this challenge. It's great to see you every week! Katherine you and I think alike when it comes to mountains and water! I really like drawings with white space, it allows you to appreciate each pattern for what it is. The snow caps are fun too and I really like how you did the sun. Must remember that! So glad to have you here, you are by far the busiest Tangler I have seen! Catching up on all of my challenges as well as participating in other challenges is a lot of drawing! You work is inspirational, thank you for participating and I look forward to seeing you every week! The border was the first thing that I admired about your drawing. Aren't we always our worst critics?! I also love that each pattern that you chose had a reason behind it that tied into the challenge. This is what I love about having loose guidelines, everyone can go as deep with their drawing as they choose. Really lovely. Oh, in that case I will leave it as it is and see if it grows on me. Thank you and thank you for providing us with these lovely prompts. I coloured my piece with dry watercolour pencils. I've been noticing that both Blogger and Photobucket alters the colours of my photos, so I've been playing with the settings to try and get the most accurate colouring. Any tips on this?